after work eliza hoover and i went to the character's bar, the marriott hotel bar in kendall square. the original intent of the the visit was to celebrate elias and rob's last day working at srm. in the end, rebecca went home sick and later so did rob (a slew of sickness in the office today, eliza jones was out sick for half the day as well). but let's be honest here, going to the bar was just an excuse to drink regardless of whether elias or rob were going to show up. elias did attend the gathering, which finally did lend some credibility to the outing. eliza hoover and i got there first, followed by sam, and then ryan. the four of us waited for about 30 minutes before the rest of the gang showed up in the form of elias, eliza jones, barbara, christine, paula, and amanda. amanda was complaining how we didn't seat ourselves properly at the table (despite the fact that we made no criticism of their tardiness). four ceiling mounted television screens where in the background and i had a hard time concentrating on the conversations, occasionally my attention drifting to inside edition and extra. i had a root beer and a serving of large fries. it was almost impossible to get the ketchup to come out of the bottle, and i had to poke at it with a straw and french fries. elias and i left an hour later along with christine. while christine went home, we went to central square to go to the people's republik. a month ago the pub club thursday night social gathering stood up joel and i at the people's republik, so the place has very bad memories for me. but an opportunity to hang out briefly with former coworkers could not easily be passed up, so there i was. when elias and i got there, julie, roy, dave, and chris were already crowded around one table, with another table they had reserved for us ready to be taken. later, klea, eliza, and jared showed up as well. the people's republik is actually one of eliza's favorite bars. this was actually my third time being there and i can pretty much say that i utterly despise the place. the people there are all local drunks and not the prettiest ones to boot, mostly guys. the decor is interesting, a revolutionary theme with red being the predominant color, but perimeter seatings are poorly arranged and the biggest sin (at least for a guy who doesn't drink, and i'm not even going to get into the fact that they didn't have root beer) is that they don't serve food of any kind (although it's easy to find food with so many restaurants around the central square harvard square area). let's make it a long time before we ever come back to this place. and why can't we go to a lady's bar for a change, where the women outnumber the men? perhaps women don't go to bars to hang out, preferring maybe the dancing beats of clubs. the topic of conversation revolved heavily on unemployment issues, with one table sitting the remaining few tsh employees, while the other table sat those who were recently laid off and now live in joblessness limbo. klea was the go-to-gal for unemployment questions, having already taken the necessary steps in claiming her unemployment benefits. it was quite insightful hearing people's thoughts about what they were going through. the sheer boredom of having nothing to do now and being alone all day at home is like a silent killer. all this talk made me jealous though. jealous not because i'm not unemployed, but jealous because back a year ago when i was let go, there was nobody to talk to. now, everywhere you turn there's somebody else who's been laid off, who can understand what you're going through, who's going through the exact same thing. it's good and it's bad. with so many people out of work, it's easy finding people to talk to who're going through the same experience, but that also means the job market is being saturated with people looking for work. back when i got canned, sure it was lonely with no one to offer any sort of guidance or support, but at least there were still jobs available back then. 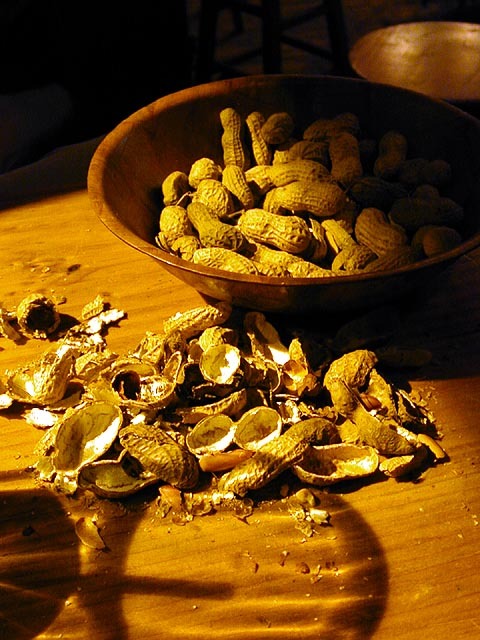 the place wasn't completely devoid of food though: the bartender (some ponytailed young man who seemed to have a small following of girl groupies around the bar) poured some peanuts into a bowl and gave them to us. with nothing else to do but drink, we dug into the peanuts, leaving a pile of shells on the table that we later crumbled completely into a fine powder. klea showed me the peanut santa, first time i've ever been exposed to such a thing. klea also resisted the urge to smoke, and the fact that she was with a bunch of nonsmokers might've saved her (at least for tonight) from taking one step closer to cancerville. we saw this guy who looked exactly like john miller, just aged 10 years. the resemblance was uncanny, and elias and i both tried to get a photo of this doppleganger, using jared as a decoy. klea gave jared, elias and i rides, dumping jared and i in harvard square while dropping elias off at his girlfriend's place back towards central square. i waited 15 nonexciting minutes before my bus came to take me home. when i got back i made myself some ramen for dinner, having not eaten anything tonight except for some fries and some bad peanuts.